Luxury camping, glamorous camping or posh camping whichever you choose to call it - Have a go and Go glamping at Dinas Caravan Park camping and glamping. An ideal birthday treat, or for celebrating anniversaries, special occasions, or a romantic break. Want a hassle free camping holiday with a tent already set up and waiting for you on arrival and a proper bed. Relax and Go glamping at Dinas. 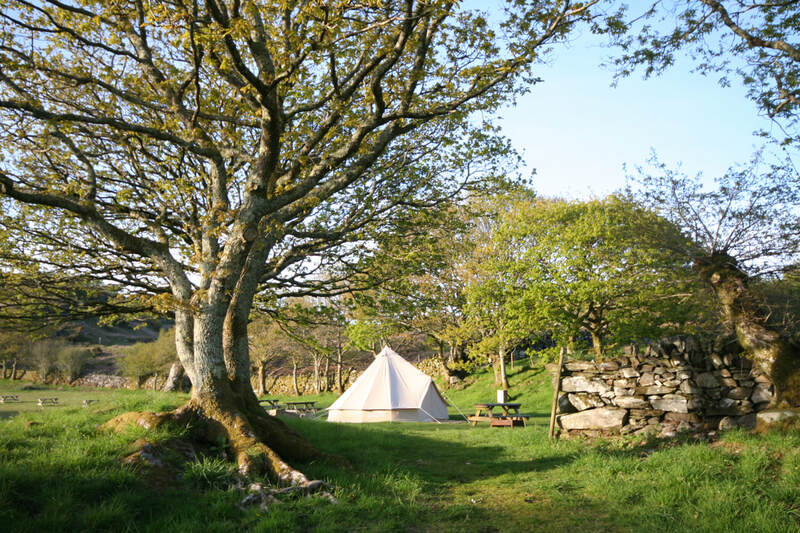 Our spacious 5 metre pre erected bell tent with natural wood burning hot tub, sleeps 2, and is furnished with a proper double bed with duvet, pillows and warm pure welsh wool tapestry blanket. No need to miss your favourite tv programme as there is a television, bedside cabinets with magazine rack, tealight chandelier, 10 amp electric hook up for lights and charging your various devices. There is also the essential kettle for a cuppa in bed in the morning, but don't forget to fill the kettle with water before going to bed; an electric blanket will keep you extra warm while the electric stove fan heater will give you instant heat. Outside you have a fire pit for toasting your marshmallows and a cooking tripod for cooking your dinner on an open fire, all cooking equipment is provided as well as crockery and cutlery. Alternatively if you do not fancy cooking there are a couple of pubs in the village. Last but not least your own private natural wood burning hot tub for pure relaxation. Simply magical on a clear starry night. Wood for the hot tub and campfire is at an additional charge. We do not allow children in our glamping bell tent with hot tub. We don't accept groups ie you cannot book more than one tent at a time. ​No dogs, no music, and no smoking in the bell tent. We also offer a glamping bell tent without hot tub for either two adults or families (2ad and 2ch) and provide two single camp beds in addition to the double bed. You will need to bring your own extra warm eg four season sleeping bags or duvets for the camp beds. ​Child minimum age is 4 years old. Please bear in mind that a glamping holiday is still a camping holiday and therefore you will need to be adequately prepared for the unpredictable British weather. Bring plenty of warm clothing for cooler mornings and evenings and wet weather gear for rainy days. As the saying goes 'There's no such thing as bad weather, just the wrong clothing'.